Over the last couple of weeks, I organized a series of book history exercises with my literature classes. I shared about 20 different editions of Frederick Douglass's Narrative of the Life of Frederick Douglass (1845) with the students. Working in groups, they selected one of the editions and wrote summaries concerning the materiality of the books. I enjoyed catching bits and pieces of the students discussing those various versions of the Narrative. "This one feels different than the others," said one group member. "This cover just looks better," said someone else. "Look how short this one is," said yet another student. 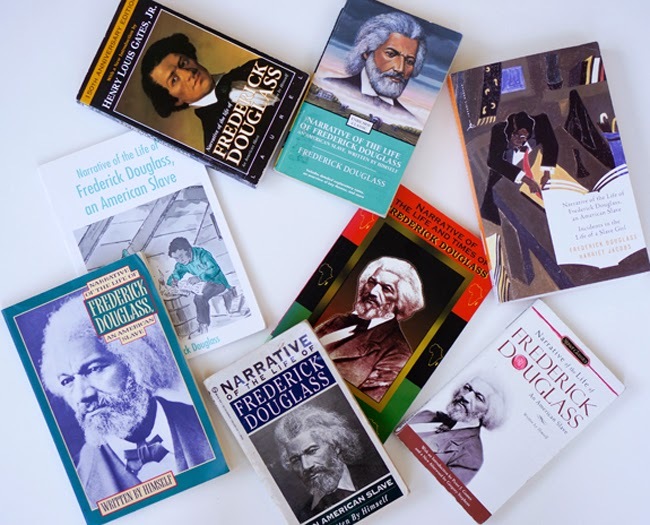 People usually talk about the content of Douglass's Narrative, but here, we were giving attention to the packaging, notes, new introductions, and the feel of the books. In other words, we were highlighting the design and aesthetics of the books. 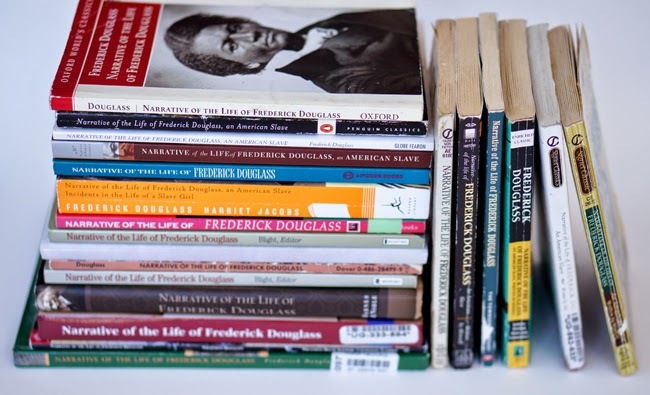 Despite the extensive body of scholarly writings on Douglass and other works by black writers, there is relatively little research on the materiality of black books. Yet, it's hard to overlook the physical presence of Douglass books, especially since so many of the editions include his striking image on the covers. More than 150 accounts of former enslaved people were published as books and dozens remain in print today. 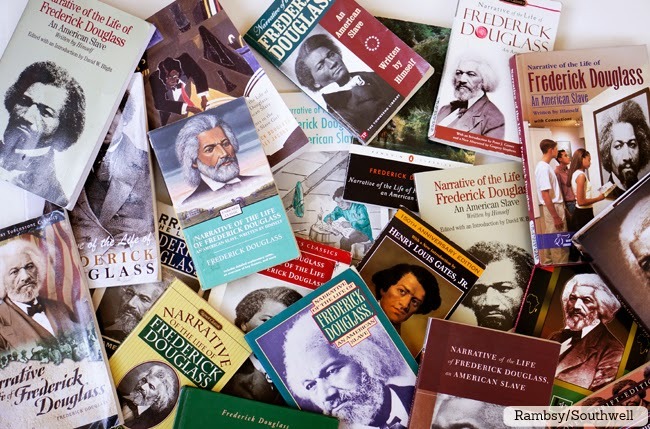 None of the authors, however, are as known by sight as Douglass, and publishers realizing that fact, regularly include the distinguished ex-slave and statesman on the front of their editions of the Narrative. The content of the books remain the same, but the paratexts or surrounding materials such as notes and introductions change over time. The editions we have include introductions by Peter J. Gomes, Robert O'Meally, Houston Baker, Deborah E. McDowell, Henry Louis Gates, Jr., Kwame Anthony Appiah, David W. Blight, and Dale E. Smith.The books are different sizes and have different page numbers. Seeing one Douglass book or 5 or 15 does not mean you've seen them all. For years, I collected editions of Richard Wright's autobiography Black Boy, so I was primed to also collect editions of Douglass's Narrative as I began thinking a little more about book history.